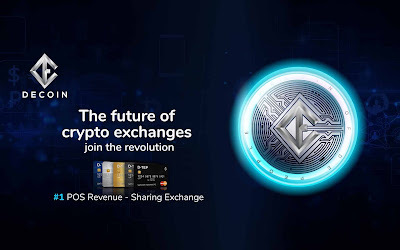 DECOIN :1st blockchain Profit Sharing Exchange platform - The discovery of blockchain technology and the development of adoption of this technology have revolutionized the financial industry. Believed or not, the initial appearance may still be underestimated. But thanks to the persistent effort of the predecessor of this technology-loving community, until finally sweet fruit. Until now the total market capitalization has reached more than 300 billion dollars. In addition, there are already several countries that apply blockchain technology and cryptocurrency to become legal currencies in the country. What's more important than all is that the blockchain and cryptocurrency that stand on top of it give a glimmer of hope to many people to be able to improve their standard of living and the opportunity to be able to raise investor funds to fund their project ideas and ideas. Here are some achievements of the cryptocurrency community since 2013. • 2013, Martercoin (Omnilayer) managed to raise funds amounting to 500K USD and became the pioneer of the ICO (Initial Coin Offering). • 2014, Ethereum emerged as a platform that provides services to anyone to create their cryptocurrency which is then used by many companies and startups as their ICO supporting infrastructure. • 2016, there were around 45 ICOs that managed to raise funds totaling more than 95 million USD. • 2017, the starting point of blockchain and cryptocurrency began to boom rapidly and rapidly where there were around 211 ICOs capable of raising funds up to 3.8 billion USD. The same year, Bitcoin became the most searched search keyword. • 2018, up to now there are around more than 14 billion USD in funds and still increasing which has been collected by 450 existing ICOs and there are still hundreds of projects that have taken preparations to enter the market in the next few months. On this occasion I will introduce you to a company that is pitting its luck in the crowd of the cryptocurrency community by holding an ICO to fund their project ideas and ideas. They call themselves DeCoin. What are the projects like and what do they offer? See the explanation below. DeCoin offers a cryptocurrency platform as well as a simple, regular and futuristic cryptocurrency trading platform. Their platform base combines the Proof of stake (POS) consensus algorithm with independent blockchain. This means that it will give results or opinions to each DeCoin token holder and rightly so, it's just that the allocation of tokens distributed to holders is the profit sharing from the trading costs generated from their trading platform. Of course this will be sustainable as long as the DeCoin trading platform continues. In addition DeCoin will also provide credit card program services to provide access to crypto assets that are easy and fast to all users. This is really something promising, especially for those of you who are interested in doing cryptocurrency trading activities with quick capital access. In addition they will also release DeCoin Crypto Index, which serves as a data presenter regarding promising profit opportunities for its users. Another feature that is no less promising is the 24 x7 call center service with multi-language around the world which I am sure there is no cryptocurrency trading platform that provides this service. This will certainly greatly support the adoption of society against cryptocurrency. Lastly and most importantly, DeCoin has applied for licenses both in Singapore and in the European Union which indicates that DeCoin is trying to be open and obedient to the prevailing regulations so that there are no significant obstacles in the future.